Writer-director Quentin Tarantino followed up the success of 2012’s “Django Unchained” with 2015’s “The Hateful Eight,” yet another western project and ironically enough - his eighth full length feature film (of course, “Kill Bill” is considered one movie here). Although Tarantino’s impressive body work is quite controversial, there is no denying that he is one of the most talented directors working in Hollywood today. His most recent work only further cements that; offering an excellent ensemble cast featuring Samuel L Jackson, Kurt Russell and an Academy Award nominated performance from Jennifer Jason Leigh. This movie takes place in the middle of Wyoming, sometime after the Civil War. A bounty hunter called John-The Hangman- Ruth (Russell) is transporting a fugitive named Daisy Domergue (Leigh) to the town of Red Rock in order to claim a $10,000 reward. However, they get caught in a nasty blizzard while on the road by stagecoach and end up finding shelter at a cabin called Minnie’s Haberdashery. They give two more men rides along the way and meet four additional unfamiliar faces when they arrive at the cabin. If there is one thing I have gathered from this tour of Tarantino’s filmography, it is that no one in Hollywood writes a script better than this man; this is on full display yet again in his second western masterpiece. His longest movie to date, “The Hateful Eight” is powered by its intriguing story and incredible dialogue that never loses your interest. Mostly confined to the setting of the deserted cabin, everybody in the star-studded cast delivers amazing performances, including Tarantino favorites Samuel L. Jackson, Tim Roth and Michael Madsen. On top of the dialogue, Ennio Morricone (“The Good, The Bad and The Ugly”) delivers his first complete Western score in forty years and it sounds absolutely incredible. That contributes greatly to the old-fashioned style of this movie, something I absolutely loved to see. Of course, Tarantino couples that with plenty of his signature humor in this film, as well as tons of absurd, over the top violence. Like “Django Unchained,” it is important to keep the time period of this piece in mind, so there is certainly some extreme content which could be found offensive. 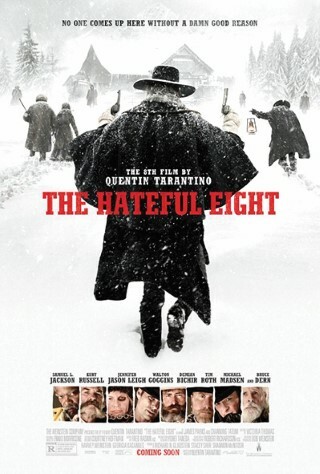 Controversy aside, I think that the “Hateful Eight” stands amongst the finest of Tarantino’s films; another entertaining homage to classic cinema, and this time, even his own work. Now that my tour of his filmography is complete, I will be putting together a list ranking his movies to date; watch out for that publication soon.